Experts agree that transportation is an economic cornerstone to a thriving community, and RST plays a significant role in economic development. The airport provides an annual economic impact for the region of $161 million in annual output, 2,911 jobs, and $73 million in annual payroll. RST is Minnesota’s second busiest airport with flights serviced by United Airlines, American Airlines and Delta Air Lines providing air service to three major hubs and beyond to anywhere in the world. 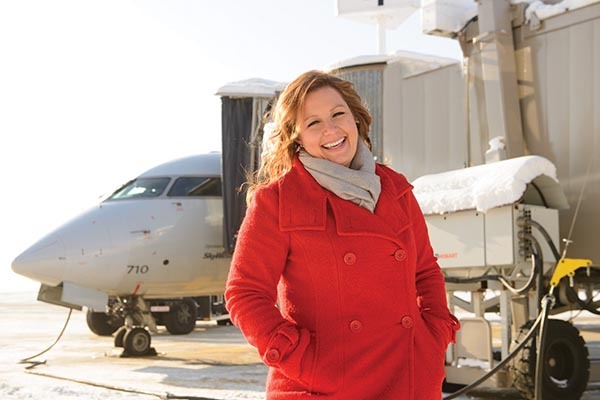 The airport accommodates 290,000 passengers annually and provides air service to southeast Minnesota and border regions of Iowa and Wisconsin. FedEx arrives daily from Memphis. In addition, there are numerous private aircraft coming to access health care and businesses ranging anywhere from a jet arriving from Hong Kong to airplanes flying from Owatonna. As priorities have evolved inside RST, it has naturally aligned with O’Connor’s deep passion for highlighting the people and care inside the airport. “I never want us to be thought of as a commodity. There is so much more to our story and culture. We live in a community that embraces caring for people, and the airport supports that vision, and we are always looking for ways to make a difference. Critical to our growth is acknowledgement of the importance of personal care for customers,” explains O’Connor. An example of this philosophy is the Caring Tails Pet Therapy program. O’Connor spearheaded the initiative as a way to enhance the overall airport experience, and provide stress relief, comfort and care to passengers through interactions with registered therapy dogs. Launched last fall, trained dogs and handlers from the Alliance of Therapy Dogs visit the main terminal during peak times, visiting customers awaiting departure and arriving from inbound flights to provide comfort. Now and then, O’Connor likes to accompany the dogs and volunteers inside the airport and is always inspired by the joy the program brings. “A significant number of our passengers are coming here for medical purposes, and that adds considerable stress in addition to general fears and anxieties about flying. It’s amazing to see what two to three minutes of contact with one of the therapy dogs does to help relieve stress and provide some joy. You can’t help but smile when you meet one of our furry ambassadors,” shares O’Connor. She sees the program continuing to grow and is always looking for more volunteers. As a global entry point, RST is often the first experience many people have when they come to the community. O’Connor discovered a human-interest story in February 2018 through Delta Global Services employee Michele Nelson’s involvement with hosting children from Mongolia through Samaritan’s Purse Children’s Heart Project. Nelson got connected with the program through Calvary Evangelical Free Church and has been hosting families for three years. The program has been a long-standing community effort for more than 20 years. Samaritan’s Purse Children’s Heart Project and Mayo Clinic have been partnering to provide life-saving operations for children from Bosnia, Kosovo, Honduras, Uganda, Mongolia and Bolivia. “Healing hearts is not a job of two organizations—it takes a wider group effort—it takes families, and it takes a community,” says O’Connor. She knew the story needed to be told and reached out to Encore Public Relations to do a short film documentary following the five-week journey inside Mayo Clinic, host family homes and the wider community. The film captures the life-saving medical care and community support through food, lodging, transportation and overall hospitality for the children, parents and interpreters. “The story is about healing more than hearts physically. It’s a much wider narrative about how our community comes together to provide hope and healing that, in the end, really transforms everyone’s heart,” says O’Connor. The story was shared widely through RST channels, area media, Mayo Clinic, area churches and other organizations. O’Connor shares, “I am so happy with the story as it really captures the spirit of our community and what we are all about.” The documentary can be viewed at flyrst.com/heart. O’Connor’s job comes with unexpected activities that involve making accommodations for global leaders and visiting dignitaries like the Dalai Lama and the presidential visit by Donald Trump. Once notified of such VIP guests, it’s all hands on deck with operational planning, security and working with local, state and federal officials. O’Connor makes sure that communication is streamlined with media and provided to the traveling public to help with delays and disruptions. Although high profile guests are exciting to see, the best part of her job involves stepping away from her long task list to watch what is happening inside RST. She’s particularly fond of military and family reunions along with passengers and employees who care for them. “It’s a privilege to witness our everyday story and the employees that work at RST serving the needs of our passengers,” shares O’Connor. Laura Archbold is the owner of Encore Public Relations, a communications, public relations and marketing consulting firm that crafts purpose-filled narratives that inspire, educate and unite to make the world a better place.